As a rule, this column has been preoccupied with what’s available in digital formats, but I’d like to start off this particular quarterly installment with a list of some of the things that aren’t available, at least not yet. This alphabetical checklist is by no means even remotely exhaustive and is entirely personal, based on a few of my recent experiences. The Asthenic Syndrome (1989). In my second World Cinema Workshop given at Béla Tarr’s Film.Factory in Sarajevo last September (my third teaching stint there), one of the most popular items I screened was Kira Muratova’s highly transgressive and visionary post-glasnost masterpiece, but I had to depend on a borrowed, pirated copy in order to screen it with subtitles. Laughter (1930). Only a couple of weeks before I showed The Asthenic Syndrome in Sarajevo, I began my course and weekly film series “The Unquiet American: Transgressive Comedies from the U.S.” at the Gene Siskel Film Center in Chicago with Harry d’Abaddie d’Arrast’s exquisitely bittersweet classic—the closest cinematic equivalent that I know to the best of F. Scott Fitzgerald (though scripted by d’Arrast, Douglas Z. Doty, Herman J. Mankiewicz, and Donald Ogden Stewart)—which I was fortunately able to screen in 35mm. But you can’t even find the full feature on YouTube, which provides only snippets from a lousy dupe. One Man’s War (1982) and Ordinary Fascism (1965). 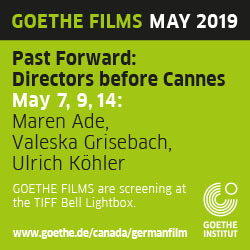 This was a double feature that I screened recently in Sarajevo: two difficult-to-classify essay films (of a sort) using found footage, both about the Nazi era, and neither of which can be found commercially with English subtitles. One Man’s War, Edgardo Cozarinsky’s greatest film to date, was produced by and for French television, which may provide a partial explanation for its unavailability. Mikhail Romm’s Ordinary Fascism, however, is a staple for many who grew up in Eastern Europe (Béla Tarr recalls having seen it in school as a child), but if you order it on Amazon (under the ridiculous title Trumps Over Violence) you’ll wind up with a copy subtitled only in Mandarin. Alain Resnais (two titles). The two most glaring lacunae here are Resnais’ first major film and the last of his features, neither of which can currently be found with English subtitles. Les statues meurent aussi (1953) also qualifies as the first major film work by Chris Marker, who wrote the script; the film’s beautiful and corrosive text is the first one Marker chose to print in his (still untranslated) two-volume 1967 collection Commentaires. It appears that the film’s unavailability on DVD or Blu-ray in subtitled form can be attributed to two forms of censorship: French political censorship when the film first appeared (which lasted for several decades), and North American capitalist censorship, which is apparently still in force. As for this year’s Life of Riley—which I regard as a sweet postscript to Resnais’ career, but not a major effort like his preceding You Ain’t Seen Nothin’ Yet (2012)—I suspect this is only a matter of time. But if you’re as impatient to see the film as I was, you can forgo the need for subtitles by ordering Alan Ayckbourn’s original play from Amazon (in Alan Ayckbourn: Plays 5) and Resnais’ film on DVD without subtitles from French Amazon. I’m now inclined to view Resnais’ career as a whole as a kind of evolution or mutation from “high” literary modernism—as represented by Cayrol, Duras, Marker, Queneau, and Robbe-Grillet—to “lower” boulevard theatre and its pop-literary (or “vulgar modernist”) equivalents, as represented by Ayckbourn, Bacri and Jaoui, Barde, Bernstein, Feiffer, Gailly, Laborit, Semprun, and Sternberg. I’m not sure where to place Anouilh, Forlani, Gruault, and Mercer in this too-neat configuration, and my placements of Semprun and Sternberg (among others) might also be contested, but it seems clear, in any case, that it was the latter tendency in Resnais’ changing taste that ultimately triumphed over the former. Erich von Stroheim (several titles). Asked by a Czech director in Bologna last June how I might persuade a young person to see a silent film, I replied, “By saying that Stroheim knows more about people than Spielberg does—and more than we do.” So it’s astonishing to me that one of the very greatest of all silent directors is so inadequately represented on DVD and Blu-ray (unlike, say, Dreyer and Murnau), especially in North America, where the only available titles are Blind Husbands (1919, on DVD from Kino Lorber), Foolish Wives (1922, on Blu-ray and DVD from Kino Lorber), The Merry Widow (1925, on DVD from the Warner Bros. Archive Collection), and Queen Kelly (1929, again on a Kino Lorber DVD). Admittedly, this comprises four solid features, but it still leaves out Greed (1924)—Stroheim’s most important and, for me, best film (along with Foolish Wives)—and the film many others consider his greatest, The Wedding March (1928), not to mention two partially directed Stroheim features, Merry-Go-Round (1923) and Hello, Sister! (1923). Greed is commercially available in France and Spain, albeit in less than ideal copies, whereas The Wedding March, to the best of my knowledge, isn’t available anywhere. I wonder if the reasons aren’t at least partially ideological, combined with the fact that some critics seem to pretend to know about Stroheim’s work without having actually seen it. I’ll never forget an evening in 1965, when I was an undergraduate at Bard College: John Simon turned up for a lecture and proceeded to read his forthcoming putdown of the third New York Film Festival, which, for him, offered not a single “first-rate” or “outstanding” film—even though it had included Alphaville, Le petit soldat, Les vampires, Gertrud, Not Reconciled, Walkover, and much else that is still valued today, including The Wedding March—nothing, in short, that even hinted of true greatness, such as Sundays and Cybèle, a Simon pick of a couple of years earlier. And The Wedding March, by contrast, was “the first part of one of those mammoth Erich von Stroheim films, reveling in lavish but indiscriminate reaction of [sic] physical details, in Stroheim’s impudent display of himself as a supposedly irresistible seducer, and in an intellectual content straight out of the novelistic kitsch of Central Europe.” (For the concluding two sentences, you can go to Simon’s well-named 1967 collection, Private Screenings.) I raised my hand after Simon’s lecture/reading, asking if he had the same opinion about Greed or any of the other Stroheim features, and he sheepishly admitted he hadn’t seen any of the others. I presume he wouldn’t have had any good reason to hunt them down since then, either. So today must be a happy time for him, digitally speaking: Sundays and Cybèle is finally available (see below), as is Alfie (another ’60s Simon favourite), and Greed and The Wedding March still aren’t. Long live high culture! Spring in a Small Town. I’m speaking here of Fei Mu’s remarkable 1948 original—by common consent (at least within the Chinese-speaking world) the greatest of all Chinese films—not Tian Zhuangzhuang’s questionable if interesting 2002 remake Springtime in a Small Town. The original is commercially available with English subtitles, but in such a lousy copy that I’m reluctant to guide you to it. The better copy that I screened last fall for my Film.Factory MA students was acquired from a Chinese film scholar who uses it in classes herself, and I hope some enterprising distributor can find some way of making it more widely accessible. Two Solutions for One Problem (1975) and Orderly or Disorderly (1981). My two favourite shorts by Abbas Kiarostami haven’t yet appeared with English subtitles on commercial DVDs, mainly, it would appear, because Kiarostami himself doesn’t like them. (As he once put it to me about the latter and better of these, it was made before he regarded himself as a “serious”—i.e., artistic—filmmaker.) On two separate occasions, I tried to persuade my contacts at Criterion and the Cohen Media Group to include either or both of these shorts as extras on their editions of Close-Up (1990) or The Wind Will Carry Us (1999), but apparently either the price was too high or Kiarostami was unwilling. Aguirre, the Wrath of God (BFI Blu-ray). The last time I looked, two of my favourite Werner Herzog films—Aguirre (1972) and Fata Morgana (1971)—were both available in North America, but on separate discs and at exorbitant prices. 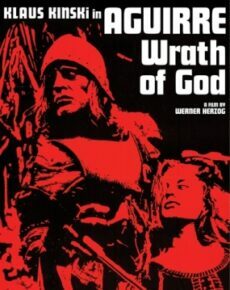 This edition from the UK includes both films (in both English and German versions, with optional audio commentaries by Herzog), along with three Herzog shorts from the ’60s. When I caught the premiere of Aguirre at Cannes’ Directors’ Fortnight in 1972, I got off to a bad start with it because of the lousy English dubbing (I vaguely recall some Brooklyn or Bronx accents) and Herzog’s fearless admission in the Q&A that the diary allegedly used as the story’s basis was his own invention. Since then, I’ve become accustomed to Herzog’s wily way with facts, and after spot-checking it’s my impression that Aguirre’s original English-dubbed version has been improved or replaced. All That Heaven Allows (Criterion dual-format). Given Douglas Sirk’s high stock these days you aren’t likely to overlook this 1955 feature, one of his most celebrated. But there’s an off chance that you might bypass Mark Rappaport’s essay film Rock Hudson’s Home Movies (1992), which is one of this release’s plentiful extras (along with some fascinating interview material with Sirk), and you shouldn’t. Borgen (MHZ Networks DVD). 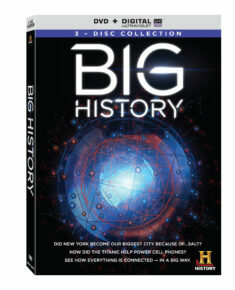 When I recommended Big History to James Naremore, he countered by recommending to me this other recent TV series, which led me to order the first season of ten hour-long episodes. By now, I’ve watched the whole package of this Danish political drama; the intelligence and energy with which the first episode crosscuts between two interlocking scandals got me hooked for the remaining installments, not to mention several more scandals. Unlike Big History, there’s little here that strikes me as “new” in terms of filmmaking or content (apart from some mordant flashbacks and flash-forwards to chart the history of a romantic relationship), but as a canny drama about how politics works it’s utterly absorbing. I’ve already ordered the show’s two remaining seasons, eager to discover what happens to the series’ two overachieving heroines (a prime minister and a TV journalist) and the troubled but efficient spin doctor who shuttles uneasily between them. 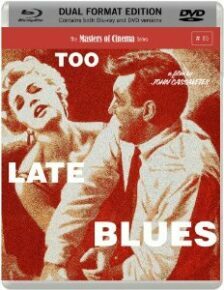 Cassavetes x 2: Too Late Blues (Masters of Cinema dual-format) and Love Streams (Criterion dual-format). I might have made earlier trips to Brooklyn from Manhattan, but the earliest one I can remember was to a large Loews theatre to catch the first New York engagement of John Cassavetes’ second feature in 1961. Like virtually everyone else who had seen Shadows (many times, in my case), I found it disappointing, yet hardly deserving of the utter scorn it received from most serious reviewers at the time (apart from Parker Tyler in Film Culture), who seemed committed to the notion of “film” over “movie” even when they didn’t clearly understand what the differences consisted of, especially for the filmmakers involved. After all, even Shadows had its phony and contrived moments (which critics were willing to overlook), and not even Dwight Macdonald seemed to grasp that the film was about the selling-out that Cassavetes’ signing a contract with Paramount entailed. Even so, Everett Chambers’ singular performance in a stereotypical role as an evil agent is every bit as remarkable in a way as Rupert Crosse in a non-stereotypical role (and Ben Carruthers in a no less stereotypical role) in Shadows, and I would still defend some of the tactical “errors” in Too Late Blues as vibrant indicators of Cassavetes’ authenticity. As I wrote for Soho News in 1980, “For many critics, the height of absurdity in Too Late Blues is reached when Bobby Darin forces Stella Stevens’ face into a sink after [her character’s suicide attempt], and there is a sudden cut to her face under the faucet as seen from the vantage point of the sink drain. Cassavetes’ refusal to tear away from an actress’ face at a crucial moment, regardless of all the technical gaucheries and jeers that this will cost him, is largely what his awful, irritating integrity is all about.” In his mainly sympathetic video interview about the film (one of many extras in the Masters of Cinema package), David Cairns persists in denigrating this arty shot, but for me the film would be diminished without it, just as the outrageous cuts to the actor replacing the dog in the closing scene of Love Streams, which are even harder to justify “logically,” are both ridiculous and irreplaceable. Much is rightly made in the extras on Too Late Blues of the relevance of jazz to Cassavetes’ art, even after acknowledging that the dialogue in his films was mostly scripted, and it’s important to bear in mind Miles Davis’ insistence that an essential part of the art of jazz is the capacity to make mistakes—a truism about risk-taking and passionate creativity that makes the pile-driver mechanics of this year’s Whiplash seem even more like egregious nonsense (even if they’re apt to elicit hosannas from some of the unlikeliest quarters). Love Streams—in some ways my favourite of all of Cassavetes’ films, complemented by Criterion with copious extras—is full of such “mistakes,” none of which I would be happy to do without. 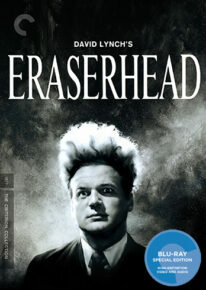 Eraserhead (Criterion Blu-ray). As with All That Heaven Allows, you aren’t likely to overlook this deluxe edition of my favourite David Lynch feature, which includes a 4K digital restoration of the film and countless extras, including six Lynch shorts, a 2001 documentary of his about the making of Eraserhead, his own video introductions to everything, and a great deal more. What you might overlook is how even today, 37 years after the film’s release, Lynch steadfastly refuses to reveal how he created the film’s notorious baby—an omission which I find even more disturbing and terrifying than anything in Eraserhead itself. 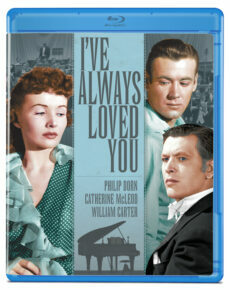 I’ve Always Loved You (Olive Blu-ray). Shot in delirious Technicolor, Frank Borzage’s 1946 classical-music weepie—which manages to oscillate between the sublime and the ridiculous just about every time you have to catch your breath—offers a kind of conundrum to critics uncertain about how seriously they should take it. 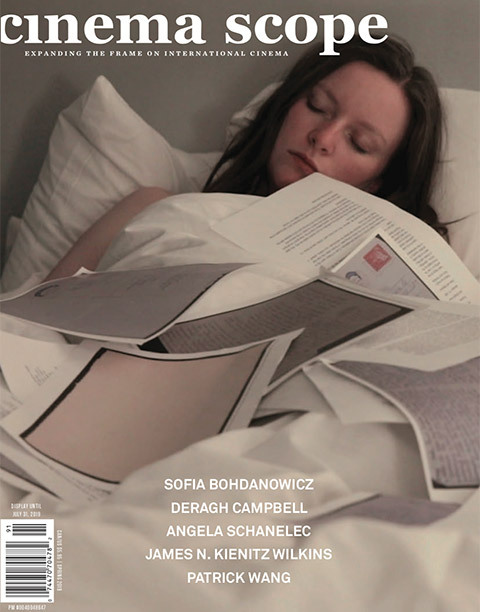 Kent Jones, in his important essay on Borzage in the September-October 1997 Film Comment, tries to navigate the problem in one breathless sentence: “I’ve Always Loved You is a misleading title for an extreme film brought to the brink of madness by its candy-box color scheme and completely disconnected acting, in which various forms of soaring communion (master/disciple, music/musician, callow lovers out of balance) are mingled and hopelessly confused, then sorted out through the medium of an unsuspecting third party.” (For the record, the film’s working title was Concerto.) Almost a quarter of a century earlier, in the Spring 1973 issue of Focus!, John Belton tried for a mainly straight appreciation (included in his 1983 collection Cinema Stylists). But by far the most comprehensive, detailed, and helpful critical treatment that I’ve encountered (which also responds to Belton’s piece) is in Hervé Dumont’s invaluable 1993 book on Borzage, published in English translation by McFarland in 2006. For me, the beauty of the film largely resides in how completely Borzage can make an extended performance of Rachmaninoff’s 2nd Piano Concerto indistinguishable from the film’s dramatic action—a rare and stunning achievement. Keeper of the Flame (Warners DVD). I hasten to add that outside the jazz context, mistakes are most often simply mistakes, and I must say that I regard this 1942 MGM George Cukor-Spencer Tracy-Katherine Hepburn opus as a whopper. I was driven to watch it by Donald Ogden Stewart (see Laughter, above) having described it as “the picture I’m proudest of having been connected with—in terms of saying the most about Fascism that it is possible to say in Hollywood.” Whether or not Louis B. Mayer actually walked out of the Radio City Music Hall opening in a huff (as Stewart liked to think he did in his 1975 autobiography By a Stroke of Luck! ), the sheer silliness of the story is, alas, what endures. 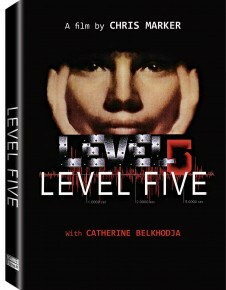 Level Five (Icarus Films DVD). A good friend who’s both a critic and a teacher recently said to me that he thought Chris Marker was a great writer, but not necessarily a great filmmaker when it came to composing and juxtaposing images. While I could see what he meant, looking at the opening sequence of Marker’s late masterpiece Level Five (1996) two weekends later, I couldn’t help but wonder if my friend had seen this visually rich (and beautifully written) fictional essay—something I felt especially primed for through the lucky accident of reading Maureen Freely’s exceptionally fluent retranslation of Orhan Pamuk’s The Black Book at the same time—whose alternate chapters are fictional essays that are every bit as visual (or at least as “visual”) as the purely fictional-narrative stretches. The fact that Level Five channels both Preminger’s Laura (explicitly) and Resnais’ Hiroshima mon amour (implicitly) only begins to describe the breadth of its historical, poetic, and ethical agendas, which focus mainly on the cataclysmic deaths on Okinawa in 1945 (many of them self-inflicted) and the heroine’s grisly task (taken over from her departed lover) of contriving to make a video game out of that battle. Admittedly, Catherine Belkhodja—Marker’s muse and the film’s only actor, addressing the camera as if it were a computer monitor for much of the time—is no Emmanuelle Riva, especially when she has to address a toy parrot. But it’s characteristic that Marker uses the protracted plaintiveness of this scene as a tonal contrast to its shocking successor, a devastating clip from John Huston’s Let There Be Light (1946) that shows a traumatized American soldier recovering his memory of Okinawa. I’m still only beginning to explore the depths of this profound work, but I can already recommend three helpful texts: an essay by Christophe Chazalon included with the DVD taken from Chazalon’s own web site, www.chrismarker.ch; an essay by Raymond Bellour at www.screeningthepast.com/2013/12/chris-marker-and-level-five/; and a recent book review, www.nybooks.com/blogs/nyrblog/2014/oct/23/descent-hell. 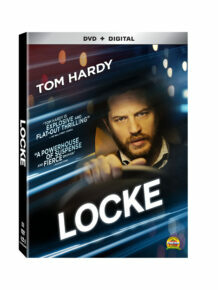 Locke (Lionsgate DVD). I saw and liked Steven Knight’s new English feature when it came out, but what amazes me about re-encountering it on DVD—which has led me to value it still more—is how much it’s already been either forgotten or ignored by my colleagues. The challenge of how to classify it may be part of the problem: it’s generally described as some sort of tour de force (given that it is 84 minutes of Tom Hardy driving while talking to colleagues, family, and acquaintances on the phone), which may be a backhanded and misleading description insofar as the film is not so much a stunt as a story that couldn’t be told any other way. Watching the “making-of” featurette on the DVD and listening to Knight’s commentary clarify that, in some ways, Locke is another case of documentary elements rendered in movie terms: even though the story and characters are fictional (and the protagonist’s name a reference to the philosopher John Locke and his definition of the self through a “continuity of consciousness”), the drive was shot several times, and even the phone calls are real, recorded live and in real time during the various drives. A road movie? Yes and no: in terms of impact and resonance, the movie feels to me more like a heroic, existential western that essentially focuses on the hero’s endurance in relation to a series of moral and practical challenges, which inevitably becomes a series of moral and practical challenges for the audience. However one winds up defining it, it’s a definite inclusion on my next annual ten-best list. 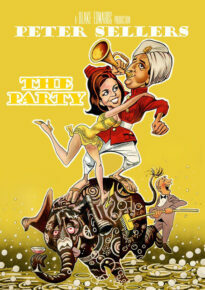 The Party (Kino Lorber Blu-ray). Although I was once driven by the overestimation of Blake Edwards to call him the Perry Como of American slapstick, it would be silly to deny his talent. And it would be especially silly to deny the virtues of what is conceivably his best feature (1968), even after coming across colleagues who still prefer it to Tati’s PlayTime (which it periodically and visibly steals various gags and gadgets from), apparently under the assumption that it’s playing a comparable sort of game with the audience. In fact, as the extras on this disc repeatedly make clear, The Party (made the year after PlayTime) was almost entirely improvised, whereas PlayTime was almost entirely scripted (and required years of preparation). Yet the more important differences remain what they do to and with an audience. Tati isolates audience members from one another by creating a complexity of focal points whereby one spectator will laugh at what another spectator misses, before drawing everyone together in the film’s closing act and making it a collective experience. (In his own way, using very different equipment—i.e., his own voice and body—Richard Pryor does something comparable at the beginning of Richard Pryor: Live in Concert (1979), when he engages first with the paranoia of the black members of the audience, then with the paranoia of the white members, ultimately bringing the two groups together once it becomes clear that he’s dealing with a shared paranoia.) Edwards, like Tati, is dealing mainly with social discomfort, but he’s basically aiming at everyone in the audience at the same time, guaranteeing that all the laughs come in unison. Sundays and Cybèle (Criterion Blu-ray). This release offers me my first opportunity to re-see Serge Bourguignon’s Oscar-winning first feature since it premiered in New York in 1962 (ahead of its French opening), and I’m still not entirely resolved in what I think about the film. The aggressive use of music to needlessly hype an already overwrought closing sequence qualifies for me as an acute case of directorial misjudgment, and some of the fancier camera setups similarly register as overkill, especially unwelcome in a story predicated on a sense of delicacy. Today I’m mainly inclined to regard Bourguignon as a talented landscape artist—partially on the basis of his ignored second feature, a Hollywood effort called The Reward, which struck me as quite interesting when I saw it in Alabama in 1965—with a limited feeling for narrative. But in spite of these misgivings, the performances by Hardy Kruger and Patricia Gozzi and the cinematography by Henri Decaë are justly celebrated (even when the latter seems to trump the former, as Manny Farber complained back in the ’60s). In her essay accompanying this Criterion release, Ginette Vincendeau ably navigates the discrepancies between the wilfully innocent readings of most critics in the ’60s with the more pedophiliac readings of today that are apt to collide with the earlier ones. Union Depot (Warner Bros. Archive Collection DVD). Alfred E. Green, a studio workhorse with 114 directorial credits listed on IMDb, is a largely unsung figure, yet on the basis of the little I’ve seen, especially of his early ’30s work—most notably Union Depot (1932) and Baby Face (1933)—he clearly warrants further investigation. The opening shot of Union Depot, a lengthy take entering and exploring the title location, is a jaw-dropping piece of artful camera choreography and mise en scène, and the 60-odd minutes that follow, featuring Douglas Fairbanks, Jr. and a flock of ’30s standbys (including Joan Blondell, Guy Kibbee, Alan Hale, and Frank McHugh), is pretty impressive as well. 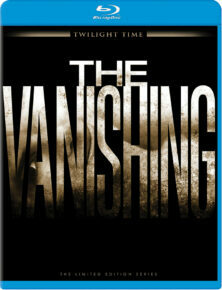 The Vanishing (Criterion Blu-ray) and The Vanishing (Twilight Time Blu-ray). 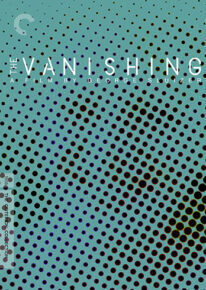 When I briefly reviewed the original version of George Sluizer’s The Vanishing (1988) for the Chicago Reader in early 1991, the film had made such a faint impression on me that I was fairly dismissive: “Thematic echoes from Hitchcock’s Vertigo, The Lady Vanishes, and Rope crop up in this 1988 Dutch thriller, about the disappearance of a young woman from Amsterdam (Johanna ter Steege) during a holiday in France with her husband (Gene Bervoets). [I should have written “boyfriend.”] Delayed exposition about what happened to her and why succeeds in holding some interest, but by the end you may feel you’ve been taken on an unenlightening ride around the block.” So unenlightening, in fact, that when Criterion recently sent me a Blu-ray—shortly before Twilight Time sent me another Blu-ray of the much-reviled 1993 American remake, also directed by Sluizer—I felt I could watch both as if for the first time, which was literally true of the remake. Both films, to be sure, play elaborate cat-and-mouse games with the spectator that mirror the movements of the plot—specifically, the cat-and-mouse games played by a bourgeois chemistry teacher who gratuitously abducts a young woman at random, and the woman’s boyfriend, who spends the next several years obsessively trying to discover what happened to her, following diverse clues planted by the teacher. And the fact that the spectator is made to share the boyfriend’s obsessive quest obviously makes Sluizer the allegorical surrogate for the creepy chemistry teacher, cinching the Hitchcockian narrative dynamics that I had already detected in the original. But casting Jeff Bridges, one of my favourite actors, in this part in the remake (a daring move that pays off handsomely) and beginning the film with this character and his preparations for the abduction is one of the two key factors that won me over, the other being the introduction of a new character—a second girlfriend for the boyfriend played by Nancy Travis, to replace the more diffident and strictly generic character in the original—who’s assigned a far more pivotal role in the action. In her essay for the Twilight Time disc, Julie Kirgo mounts a noble defense for the remake, most of which I can subscribe to, apart from two demurrals: (1) Her claim that “the critical setting for both movies—a roadside service area—is in many ways far more typical, and thus more ominous, in America than it could ever be in Europe,” suggests to me only that she hasn’t spent much time in Europe outside the major cities. (2) Her suggestion that a spunky and industrious working-class heroine “more active than [her boyfriend] and more intelligent than [the villain]” might well have provided an “Americanization-feminist reinterpretation of the film [which] offended…many critics” is for me only part of the probable reason for the remake’s poor commercial and critical reception. An equally plausible explanation is that it was released in the US only a couple of years after the original, when the plot basics were still too fresh in the minds of most reviewers, including Ebert, to enable them to respond to the story as if for the first time. Conceivably the same problem affected my response to the original when I re-saw it. But I would still argue that Sluizer’s rethinking of the material in the remake, which Ebert and other reviewers interpreted simply as crass commercialism (even though the movie flopped), is no more crass or commercial than Hitchcock ever was in his own deliberations, including when he remade his own classics. In fact, Travis’ character reminded me of Barbara Harris’ role in Family Plot (1976), and the film’s closing gag is every bit as Hitchcockian as many of its earlier passing comic inflections, such as the snapping on of a car safety belt perceived as a potential trap. In any case, I can highly recommend both versions of the film, in whatever order, if you haven’t seen either one; but if you’ve seen only the original, I would urge you to check out the remake as well. 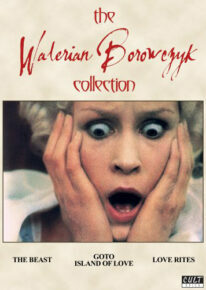 The Walerian Borowczyk Collection (Arrow Academy dual-format). Unsolicited by me but entirely welcome when it arrived in the mail, this very handsome prize package from my favourite new digital label (based in the UK) includes short films and animations (including the feature-length animated Theatre of Mr. and Mrs. Kabal, 1967) as well as Goto, Isle of Love (1968), Blanche (1971), Immoral Tales (1974), and The Beast (1975), along with an illustrated 344-page book (actually, two books in one: Camera Obscura, a comprehensive collection of essays about Borowczyk edited by Daniel Bird and Michael Brooke, and Anatomy of the Devil, a collection of nine of Borowczyk’s short stories). I must confess that I haven’t kept up with Borowczyk since his early features, mainly because of vague or misplaced inhibitions about Eastern European surrealism and animation, but my first look at Camera Obscura and my second look at Goto have already brought home to me the errors of my ways.